(Reuters/Jayanta Shaw)Young Christian Indians rally against persecutions in 2016. Compassion International, a major international Christian aid group that assists the impoverished, will next week cease its aid operations in India, citing the refusal of the country's government to let it accept foreign donations. The Indian Government claims that two of its affiliates had sought to convert children, and have refused pleas to reconsider from U.S. diplomats and the organization itself, the Australian Broadcasting Corporation reported. The chief executive of its Australian arm Compassion Australia, Tim Hanna, said the decision is saddening, and ends nearly 50 years of aid in the country. "It's hard to comprehend that you can just say, well there's 147,000 children who are getting help and support and we're going to not allow that help and support to continue," he said. "That's hard for me in my mind to comprehend." Colorado-based Compassion International said its partner Bethesda Charitable Endeavors had no choice but to formally end its Indian operations on March 15, ending support for 147,000 impoverished children there. The shutdown of Compassion International comes as India, as a rising economic power with a surging spirit of nationalism, curbs the flow of foreign money to activities it deems "detrimental to the national interest," The New York Times reported. More than 11,000 nongovernmental organizations have lost their licenses to accept foreign funds since Prime Minister Narendra Modi and his Bharatiya Janata Party which has links to Hindu nationalist groups, took office in 2014. Among the Western funders barred from transferring funds without permission from Indian security officials are George Soros's Open Society Foundations and the National Endowment for Democracy. 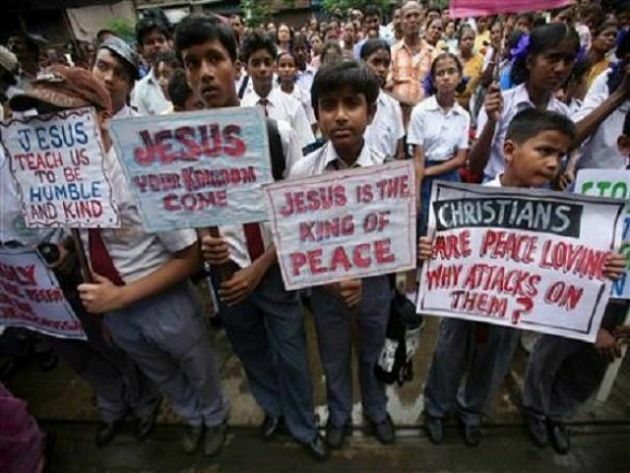 The move also comes as Christians in India face growing hostility and violence from Hindu extremists, CBN News reports noting that Open Doors has moved India to number 15 on its list of countries where it's hardest to be a Christian, up from 31 in 2013. Compassion says that about 40 percent of the local Indian churches that it has partnered with are still working with children, just without Compassion's financial support. Compassion partners with more than 7,000 churches in 25 countries to provide child development aid for nearly two million children. Compassion's executives vehemently deny India's allegation that it is funding religious conversions, and say India has given them no chance to rebut the accusation. Instead, they say they found themselves in shadowy back-channel negotiations with a representative of the Rashtriya Swayamsevak Sangh, or R.S.S., a right-wing Hindu ideological group that is closely connected with the Bharatiya Janata Party, or B.J.P., but that has no official role in governing, said the Times. The United States and India were at loggerheads over Compassion International the Times reported March 9. Mark Toner, a spokesman for the State Department, said that Washington would raise the issue with India, and he urged the government there to "work transparently and cooperatively" in enforcing laws regulating foreign aid. "Unfortunately, we've seen over the past couple of years a number of foreign-funded NGOs in India that have encountered significant challenges in continuing their operations," he said. "These NGOs do valuable work," he added. "Certainly, these countries and governments have their own reasons for the laws they pass, but we believe it should be transparent and clear why they're shutting down these organizations."